Iraq Veterans Against the War asked supporters to use social media this Veteran’s Day to speak about personal experience with militarism. I don’t have much direct contact to report, unless you count carrying a sense of American shame and holding a deep well of sadness for the amount of senseless violence, killing, overspending, and harm done to the world’s people and resources in the name of liberty and justice for all. My immediate family is not militarily descended, though among my few relatives who were called up, I remember an uncle named Charlie who went to Vietnam and mercifully returned, then asked to be called Charles from there on; I have not seen much of him in 30 years, but I suspect he’s suffered, the result of time served. My own conscientious objection and moral opposition to war developed out of the lessons taught by a few good teachers who waged stealthy anti-militarism campaigns in their high school classrooms: Images from documentaries on the Holocaust and post-atomic bomb Japan have stayed with me strong since I saw them. An education in war’s atrocities, along with my own love of the message music of the ‘60s and ‘70s, I believe schooled me well, until I went on to research and learn more. Created at the height of the Vietnam era, conceived with strength and intended as a balm and wake-up call for all that had gone wrong, artist/activists from Buffy Sainte-Marie (“Universal Soldier”) and Phil Ochs (“I Ain’t Marching Anymore”) to giants Bob Dylan (“Blowing in the Wind,” “Masters of War”), John Lennon and the Plastic Ono Band (“Give Peace a Chance,” “Imagine”), the stars of Motown (Marvin Gaye’s “What’s Going On?”, Edwin Starr’s “War,” written by Whitfield and Strong) and singers, songwriters and performers of all forms (“Peace Train” by Cat Stevens and “Love Train” by the O’Jays”), delivered the songs of peace. Quite often they took anti-war sentiment to the top of the charts. It was a time when an anti-war view didn’t have to fight for space on the front page or evening news—it was the news. Back then, unless they were complete squares, members of the silent majority or total idiots, men and women were not afraid to stand against war. 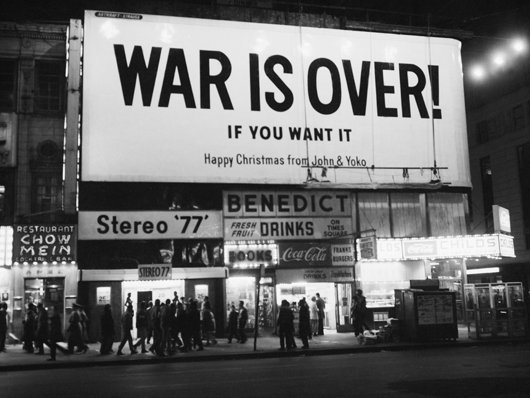 “War is over,” the present tense affirmation that serves as the chorus to”Unknown Solider,” predates the use of the phrase in the Plastic Ono’s Band “Happy Xmas (War is Over)” (1971); it coincided with the Phil Ochs song “The War is Over” (1968) and knowing Morrison’s influences, was likely borrowed from French filmmaker Alain Resnais’ 1966 film, War is Over, a political thriller set in Franco-era Madrid and Paris. As time went on, the anti-war song fell out of favor, at least in the U.S. where our direct involvement in wars was mostly covert and away from our shores. Now and again, we’d get a crucial reminder that war is bad and killing is no good in songs (“War” by Bob Marley), while other times when war was declared and battles raged on, anti-war songs experienced a tiny revival (“Killing in the Name” by Rage Against the Machine comes to mind, as does “Living With War” by Neil Young who continues to wage peace every day of the year). But unless mandatory service makes a comeback, it is guaranteed you’ll hear fewer songs of resistance to war, or resistance to much of anything, really. Killing for peace, bombing for safety and drones from here to kingdom come are not really what the people want from their songs anymore. Until further notice, the rocket’s red glare shall shine on, while few take a stand in song to abhor them. Where are the songs that urge calling off drone strikes? I know there are some, but they are not on the Top 40, blasting from jukeboxes and commanding the dancefloor the way Edwin Starr made a stand: “War! Huh-good God, y’all, what is it good for? Absolutely nothing. Say it again. Yea.” Though once again, the ’60s generation—I’m not saying they’re the only ones, but in terms of longevity, staying the course, consistency of message and laying it down—comes through. Septugenarian Graham Nash cut a song with James Raymond for Bradley Manning. Nash had done the same for Bobby Seale and the Chicago Seven who among other things, opposed the war. I’m not telling fans of ’60s rock anything they don’t already know. But for the sake of the song, if you’re a singer or a songwriter and think that killing and torture in the name of what is wrong, use your stage to sing out and decry the lie, even if it’s just one song. Or do something: Professional musician Darden Smith is writing songs with vets. Recounting their experiences with war and turning them into songs, Smith has aided soldiers in coming to terms with their opposition to violence of all kinds. The Veterans Against the War say on their website that everyday, 22 veterans take their own lives. Could it be that they cannot stand the post-traumatic stress of remembering? Were they tortured, or asked to torture someone else? We will not know now or ever because they’re gone, as are the great mean of peace, Gandhi, Dr. King and John Lennon. Today I thank all, veterans and others, who fought and now work for peace: You remind us that we can not tell ourselves that war is something that only happens over there, far away, to other people. We cannot continue to pretend that we are not connected or impacted too. We are responsible. The horror, the horror. It’s a bit grating to know that while drone strikes continue to kill innocent Pakistanis, our own anthems and national songs rage with more furor at sporting events and gatherings. We thought this sort of nationalism was bad for Japan, didn’t we?